Oprah Winfrey Laboratories blesses resveratrol and Americans rush to buy red wine pills. But will anybody live any longer? 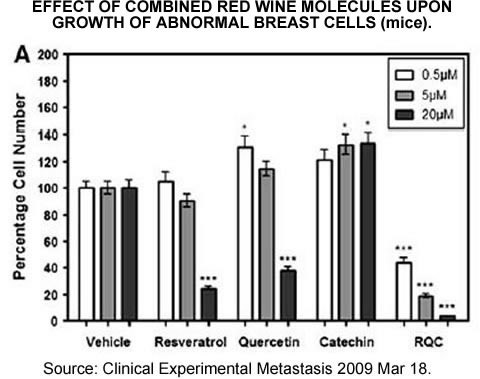 The luster surrounding the red wine molecule resveratrol isn’t fading, but the growing body of pseudoscience being created by online hucksters, as well as exaggerations by scientists who have a commercial interest in a resveratrol-like drug, casts a pall over the excitement of a maybe-it’s-real-this-time anti-aging pill. Few Americans who go online have escaped the barrage of spam advertising for one particular brand of resveratrol (rez-vair-ah-trawl) pills, which has within the past month or two become the leading brand by sales volume. What six years of growing science, front-page coverage by the New York Times, The Wall Street Journal, Fortune Magazine, and a CBS-TV 60 Minutes special report couldn’t do, spammers and the blogger accomplices did – create a swelling demand for red wine resveratrol pills. What consumers failed to read, in the fine print at websites, where terms of sales were posted, that they were going to be billed $87 a month if they didn’t call back and cancel an autoship program within 14 days of receiving their free 15-day supply. Add to all that the fact that Dr. Oz and Oprah Winfrey have now blessed and placed their imprimatur on resveratrol pills, and you have a modern phenomenon that a train couldn’t halt. Word has spread among spammers of the fast money that can be made selling resveratrol pills online. It’s great income for out of work real estate agents and Wall Street financial consultants. The renegade company selling this brand also has many affiliate websites where bloggers obtain commissions or click fees for sending customers. This has spawned many bloggers who now claim to be the authority on resveratrol, spreading falsehoods that could even be harmful to health. Bloggers are the most commonly found source of (mis)information about resveratrol on the internet. Proper dosing is another problem. Mega-doses (360 mg and 1565 mg) actually shortened the life of laboratory mice on a standard-calorie diet. Ivy League university researchers who appeared on 60 Minutes only mentioned their 2006 study where mice were engorged with fat and lived a bit longer, not the 2008 where mice were fed a diet similar to humans and resveratrol shortened their lives. The French will never fall for the pills, they have their red wine and it produces unprecedented longevity. France has double the ratio of centenarians of any other developed country. The longevity dosage range is 3-5 five-ounce glasses of dark, aged, red wine providing just (can you believe it) just 3-5 milligrams of resveratrol, but 60 mg of total polyphenols (resveratrol, quercetin, catechin, ferulic acid, malvidin, gallic acid, kaempferol) per glass, or 180-300 mg total daily dose. 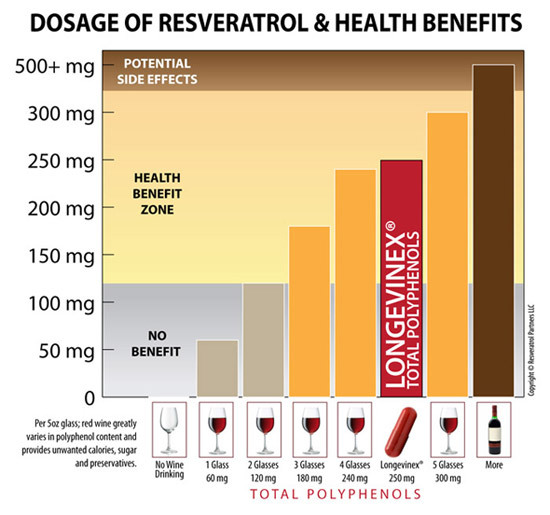 The researchers who conducted this gene array study were interviewed by Morley Safer on the 60 MINUTES program about resveratrol, but failed to mention that one commercially available resveratrol pill (Longevinex®) had already been found to produce profound biological effects, at a very low dose, and without alcohol or calories provided in wine. In fact, the SRT501 resveratrol drug being touted by a pharmaceutical company is just plain resveratrol, according to the drug company’s SEC 10k filing. Furthermore, another recently published study conducted by the drug company itself reveals that huge impractical doses of resveratrol were used to demonstrate biological effects (1000 mg/kilogram of body weight, or 70,000 mg for a 160-lb human), which is likely being employed to continue the falsehood that only mega-dose resveratrol will work. But a nutriceutical matrix (Longevinex®) was found to activate 9-fold more Longevity genes than plain resveratrol, prompting one to ask, what are we waiting for? It looks like a bona-fide longevity pill has arrived. It is becoming more obvious that mega-resveratrol, as provided in most resveratrol pills sold on the market today, may not confer longevity to consumers and may even shorten the human lifespan, if animal studies can be correlated with human usage. 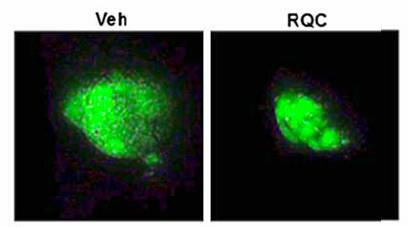 far greater biological effect at much lower (safer) doses. © Copyright 2009. Resveratrol Partners LLC. Not for posting on other websites.